America has become a nation of pill poppers. 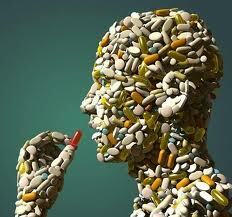 The U.S., with just 5% of the world’s population, consumes a whopping 75% of all prescription drugs. Whatever you need – don’t worry, they got a pill for it – from depression, to a long list of embarrassing maladies we discover on TV commercials. Unfortunately, pills cannot fix the human condition, they just mask the symptoms. Big Pharma is big business. The same marketers who sell cornflakes and deodorants now push the need for drugs to solve problems from toenail fungus, to shyness, to acidic stomachs. One hundred thousand Americans die every year from the effects of these drugs. Over a million are admitted to hospitals because they have a bad reaction to the drugs. The worst part is that a large portion are receiving drugs they don’t really need, or are getting drugs for problems that can be safely addressed without drugs. Molly Crockett, a neuroscientist at Oxford University, doesn’t believe we pop enough pills, or at least the right type of pills. She is proposing a “brave new world” type of drug, something akin to a morality pill. According to Crockett, studies have shown that by shifting brain chemistry you can change personalities. She even suggested a couple of chemical candidates for the morality pill. One is the hormone oxytocin which is sometimes called the “moral molecule,” or the “love hormone,” or the “cuddle chemical,” which some studies have suggested can increase a person’s level of trust, empathy, and cooperation. Other studies however have shown the hormone boosts envy and gloating, makes people more likely to favor members of their own group and increases dishonesty. A second candidate is serotonin which is often called the “happy hormone,” to enhance moral qualities such as empathy. Good news! According to Crockett, such a pill is not far from reality. Seriously, who would want such a pill, and who would decide when to use it? Most importantly, who is that WE she keeps talking about? According to an article in the Guardian, science is far from creating a pill that can turn sinners into saints. Of course they might have forgotten that we already have anti-depressants on the market that dull the senses and can turn saints into sinners. The government has been handing them out on the battlefield like candy. The whole idea reminds me of A Brave New World by Aldous Huxley. Ah Soma, the government’s drug of choice. “The world’s stable now. People are happy; they get what they want, and they never want what they can’t get. They’re well off; they’re safe; they’re never ill; they’re not afraid of death; they’re blissfully ignorant of passion and old age; they’re plagued with no mothers or fathers; they’ve got no wives, or children, or lovers to feel strongly about; they’re so conditioned that they practically can’t help behaving as they ought to behave. And if anything should go wrong, there’s soma. The governments of the world would love such a pill. What could possibly go wrong? After all, we’ve never had to deal with the unintended consequences of technology and social engineering, right?